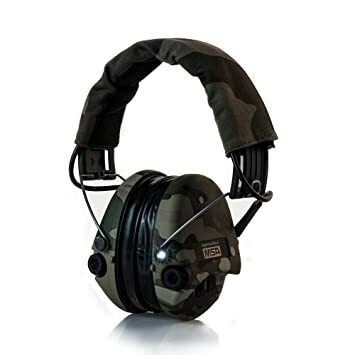 MSA Sordin Supreme PRO X US Military Grade Earwear Full Camo-Edition with fitted gel seals Sordin Supreme PRO X is developed to conform to international military specifications and other extreme conditions. These headsets produce excellent digital sound reproduction. With the MSA Supreme PRO X you can now communicate with friends and coworkers when out shooting, in the workplace, or at a race when surrounded by continuous loud noise. Superb sound quality and high amplification allows you hear better when wearing our hearing protection without letting in any harmful noise. Peak sounds are compressed to a level of 82 dB and quieter sounds are not dampened. You will have perfect situational hearing without any distracting noise. All moving components are made from steel and the circuit boards, microphones, and battery compartment are water proofed allowing for use in the most rugged of situations. The sturdy headband features a removable cover allowing for different patterns to be worn. Two separate microphones are included to reproduce ambient sounds. Within the headset is an aux input for connection to external radios and other electronic devices. The built-in electronics make it possible to combine very low battery consumption with high performance for over 600 hours of battery life. A compact three button keypad grants control of all electronic functions. A low power mode and low battery warning system is provided. Two AAA batteries are required and are included. The integrated LED lamp in the MSA Sordin Supreme PRO X is perfectly suited for persons who are hunting and shooting at night or working in low light situations. The features for the MSA Sordin Pro Neckband are: It provides optimum protection with high amplification. The Supreme Pro has an AUX input and a watertight battery compartment. 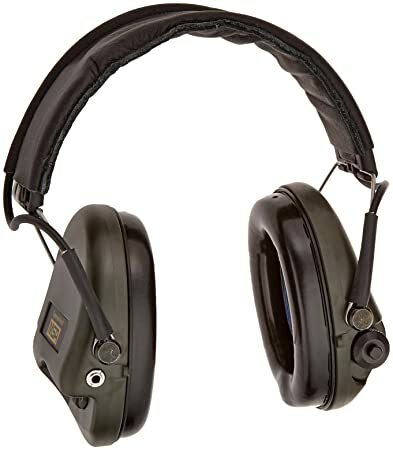 Both earmuffs are shaped to suit both right-handed and left-handed shooters. 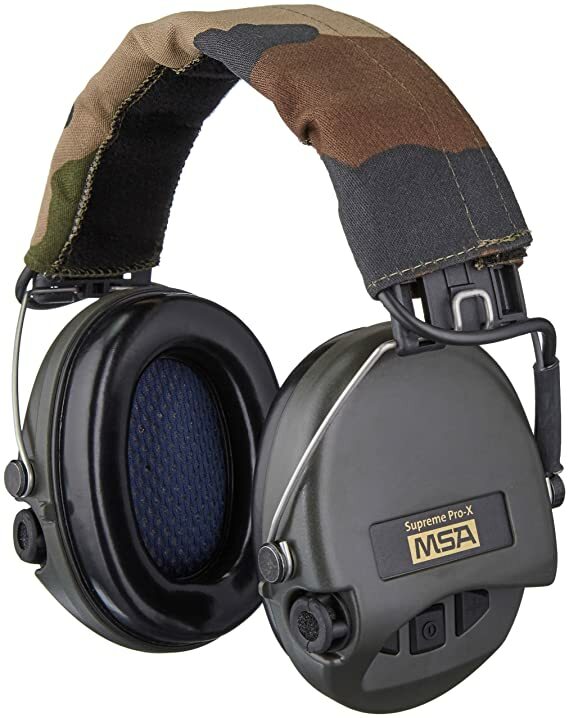 MSA Sordin Supreme PRO X – The US Military Earwear Standard Edition – black leatherband and green cups equipped with foam seals. Sordin Supreme Pro X is developed to conform to international mil-specifications and other extreme conditions. These headsets produce excellent digital sound reproduction. With the msa supreme pro x you can now communicate with your friends when out shooting, even when others are shooting around you. The electronic design makes it possible to combine very low current consumption with high performance and instead of cutting off peak sounds it compresses them down to al level of 82 db(A). The MSA Sordin Supreme Pro X are hearing protectors that reproduce a natural and realistic sound. You should have perfect locational hearing without any disturbing noise. 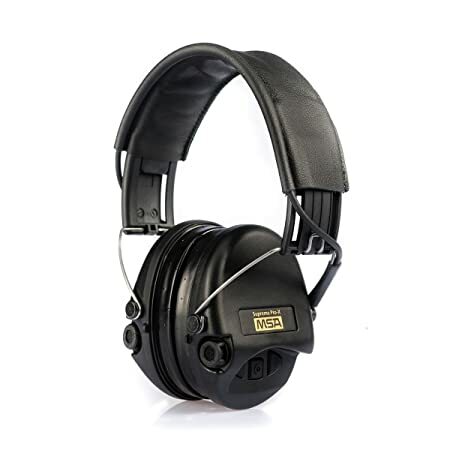 Superb sound quality and high amplification will actually let you hear better when wearing our hearing protection without letting any harmful noise in. All moving components are made of steel and circuit boards are lacquered and therefore water protected. Two separate splash proof microphone to reproduce the ambient sound within the headset aux input for connection to external radios digital electronics compress sound without chopping the incoming the sounds waterproof battery compartment and microphones close fitting slim design with neckband to allow more comfort when using helmets all electronics functions incorporated within a slim 3-button key-pad over 600 hours of battery life from 2xAAA batteries (supplied) battery save function and low battery warning system high passive attenuation. 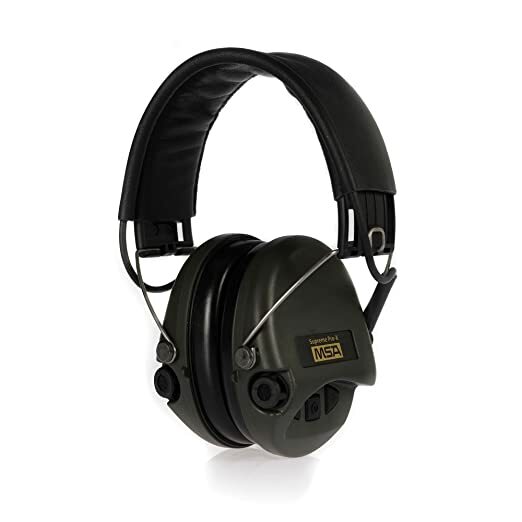 MSA Sordin Supreme PRO X – The US Military Earwear Standard Edition – black leatherband and black green equipped with foam seals. 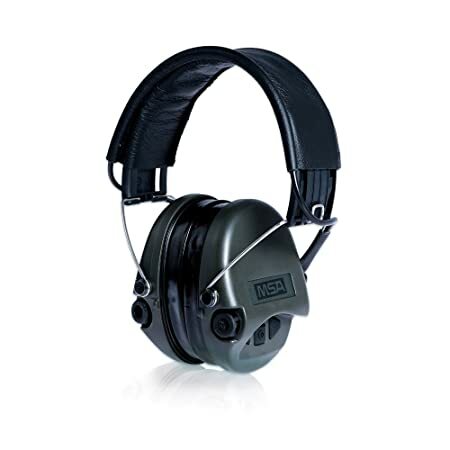 MSA Sordin Supreme PRO X US Military Grade Earwear Special Edition – black cups with fitted gel seals Sordin Supreme PRO X is developed to conform to international military specifications and other extreme conditions. These headsets produce excellent digital sound reproduction. With the MSA Supreme PRO X you can now communicate with friends and coworkers when out shooting, in the workplace, or at a race when surrounded by continuous loud noise. Superb sound quality and high amplification allows you hear better when wearing our hearing protection without letting in any harmful noise. Peak sounds are compressed to a level of 82 dB and quieter sounds are not dampened. You will have perfect situational hearing without any distracting noise. All moving components are made from steel and the circuit boards, microphones, and battery compartment are water proofed allowing for use in the most rugged of situations. The slim neckband provides great comfort even when wearing a helmet. Two separate microphones are included to reproduce ambient sounds. Within the headset is an aux input for connection to external radios and other electronic devices. The built-in electronics make it possible to combine very low battery consumption with high performance for over 600 hours of battery life. A compact three button keypad grants control of all electronic functions. A low power mode and low battery warning system is provided. Two AAA batteries are required and are included. 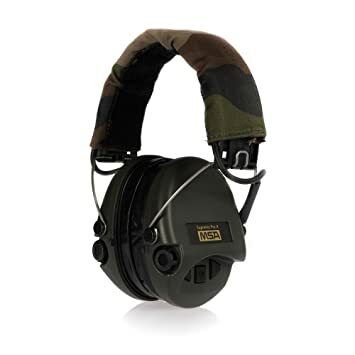 MSA Sordin Supreme PRO X The US Military Earwear Special edition – camo-band and green cups with gel seals already fitted. 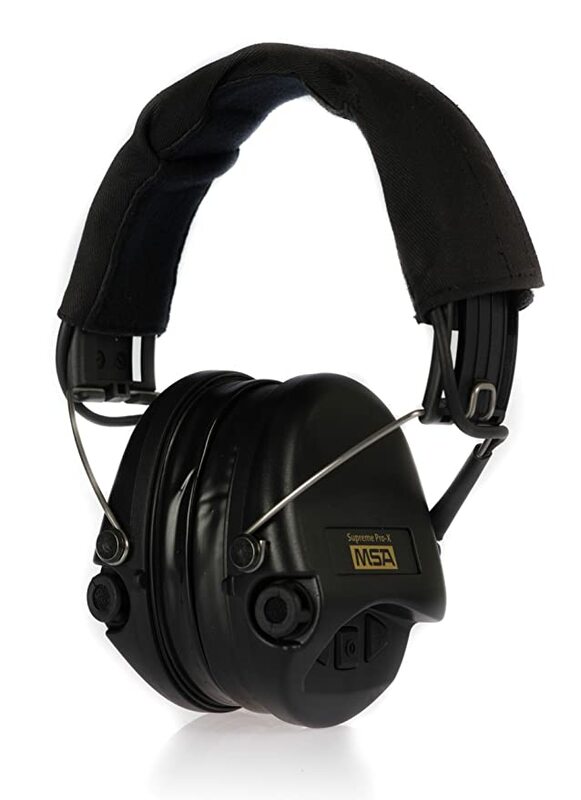 MSA Sordin Supreme PRO X US Military Grade Earwear Special Edition black headband and black cups with fitted gel seals Sordin Supreme PRO X is developed to conform to international military specifications and other extreme conditions. These headsets produce excellent digital sound reproduction. With the MSA Supreme PRO X you can now communicate with friends and coworkers when out shooting, in the workplace, or at a race when surrounded by continuous loud noise. Superb sound quality and high amplification allows you hear better when wearing our hearing protection without letting in any harmful noise. Peak sounds are compressed to a level of 82 dB and quieter sounds are not dampened. You will have perfect situational hearing without any distracting noise. All moving components are made from steel and the circuit boards, microphones, and battery compartment are water proofed allowing for use in the most rugged of situations. The sturdy headband features a removable cover allowing for different patterns to be worn. Two separate microphones are included to reproduce ambient sounds. Within the headset is an aux input for connection to external radios and other electronic devices. The built-in electronics make it possible to combine very low battery consumption with high performance for over 600 hours of battery life. A compact three button keypad grants control of all electronic functions. A low power mode and low battery warning system is provided. Two AAA batteries are required and are included. 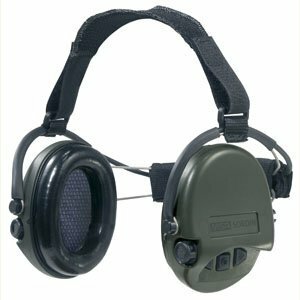 MSA Sordin Supreme PRO The US Military Earwear Special edition – black leather band and green cups with gel seals already fitted.